It’s Which Came First? from Mochimochi Land, because every child needs a little existential angst. Also, I can’t read. For some reason I thought this toy would be actual egg-sized. And it is, if you mostly hang around ostriches. And finally, I had to scratch the sewing itch. I’ve wanted to learn how to do patchwork and quilting for so long, but was frankly procrastinating out of fear. Fear that, try as I might, I would never be able to achieve the precision required to make beautiful pieces. But the fabric stash wasn’t getting any smaller (which wouldn’t be a problem except our apartment isn’t getting any bigger either), so last night I decided to bite the bullet. 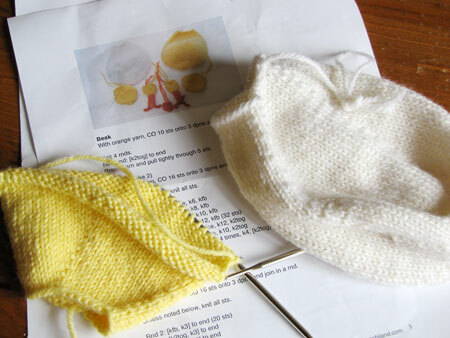 CogKnition posted this on April 10th, 2010 @ 4:30pm in Quilting, Sewing, Unfinished Objects | Permalink to "Knittin’, and Sewin’, and Thinkin’: Crochetin’?" Just in time for summer! It’s unusually chilly today in Houston, so I grabbed the opportunity to wear the finished sweater for the first and last time until December. I promptly started sweating. But did I change? No. Instead, I opened the windows and let the 40-degree outside in. Pattern—The pattern is very well written and easy to follow. This is my fifth Eunny pattern and I’ve come to expect nothing less from her. 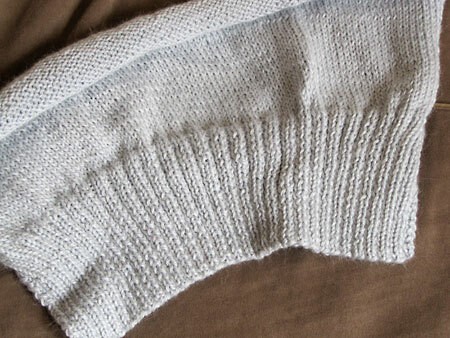 Finishing—This sweater must be blocked before wearing. 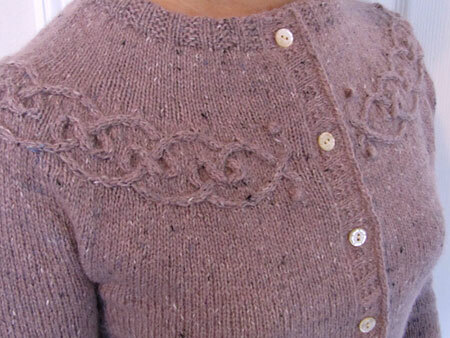 There’s a lot of puckering and wrinkling around the cabled yoke when it first comes off the needles. That all evens out after a proper wet-block. Modifications—I lengthened both the body (and thus the button band) and the sleeves to accomodate my freakishly long torso and arms. I also narrowed the sleeves at the wrist for a more fitted look. Used 8 buttons instead of 9 for the sake of mathematical simplicity. 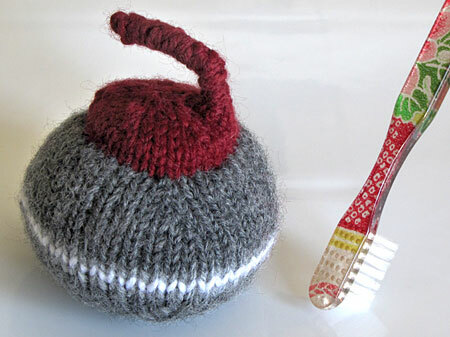 According to my Ravelry project page, I finished the knitting on this in February. Yes, it takes me a whole month to install a button band. This is why I made puppy eyes at my grandma the last time I had to do it. 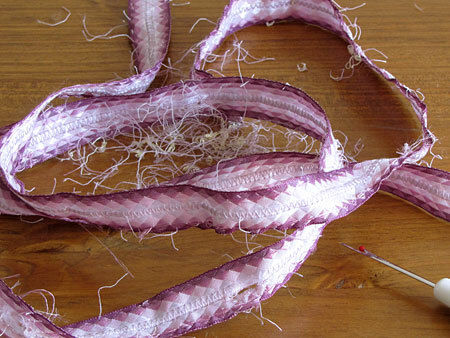 Buying the wrong width of ribbon, which meant I had to sew two strips together side-by-side. Buying the wrong kind of ribbon, which meant that it was a nightmare to work with. Failing to measure. Twice. Actually, thrice. I first produced a button band that was much too short, and then produced two more that weren’t the same length. And then I cut the buttonholes before confirming they actually lined up with the buttons. There was much cursing. And perhaps some wine. 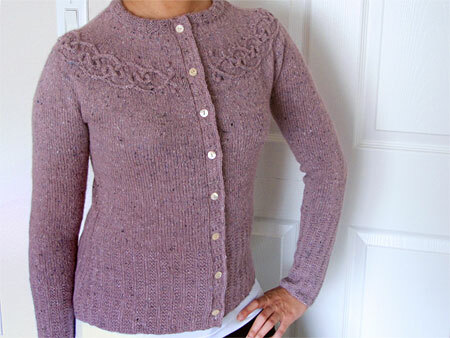 CogKnition posted this on March 20th, 2010 @ 6:45pm in Sweaters | Permalink to "Tangled Yoke Cardigan"